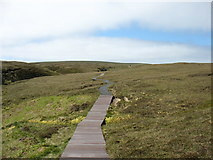 Geo-Trips :: Shetland (2) - It's a long way to Muckle Flugga! 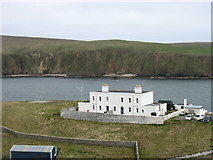 This was my first day on Unst, the most northerly inhabited island in the Shetlands. 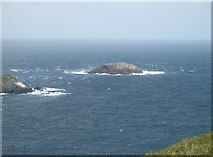 I took the opportunity to have my first sighting of Out Stack and Muckle Flugga, the most northerly islets in Britain. 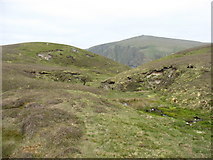 The walk was made more interesting by the aggressive bonxies: in this part of the world, always carry a stick or walking pole and wave it above your head when one flies near. 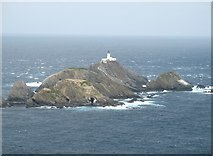 So, after just two days I had climbed Ronas Hill, seen Muckle Flugga and obtained photos in Myriads HP and HU. 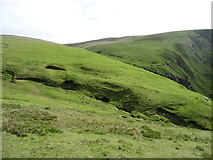 Not a bad start! 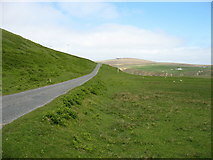 This is the main route in to the Hermaness National Nature Reserve. 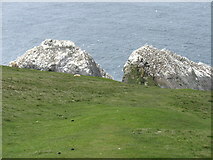 The stacks west of Hermaness Hill, in [[HP5917]], are well seen here. 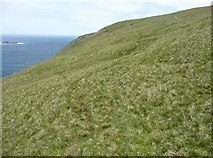 Britain's most northerly piece of land, in [[HP6120]]. 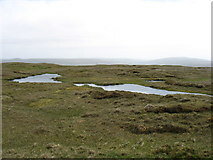 Many small lochans adorn the summit just south-east of the 200m highest point. 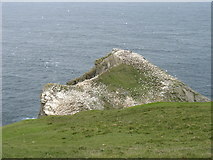 Urda and Clingra Stacks beyond. 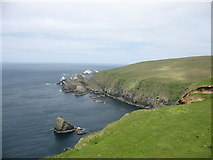 Saxa Vord [[HP6316]] in the distance, the other side of Burra Firth.